February is one of my favorite months. It is the shortest but yet the busiest! We have Valentine’s Day, Black History Month, President’s Day, & Food 4 Fines Month!!! 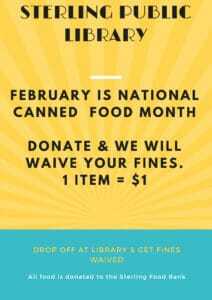 Bring in an item of food- Receive a $1 off your fines. Food will be donate to the Sterling Food Bank. It is a WIN-WIN!! 10 items =$10 off of fines or can be used for credit!